“I did not plan on speaking… but listening to the other people in the room, I have this mental image of Larry saying “lighten up folks!” We all know Larry was big on safety. We all know Larry stressed competence in everything he did. Now let me tell you a story. 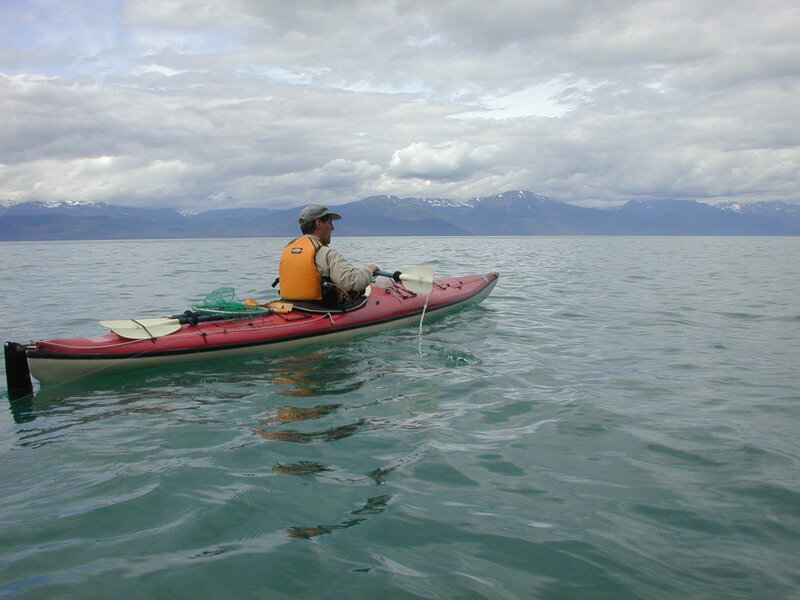 About ten years ago, Larry and I kayaked Tracy Arm. We planned to be out 10 days. Larry always listened to the weather forecasts. The weather forecasts didn’t look good. The day we were to leave was cloudy, raining, the wind was blowing, just generally lousy. We both agreed to scrub the departure. The next morning was the same, but in the afternoon a patch of blue sky, locally known as a “sucker hole”, appeared. We loaded up and went. It was beginning to rain when we got dropped off at the mouth of the fjord. It rained for six of the next eight days… we kayaked the entire length of Tracy Arm in one day simply because it was drier inside the kayaks than outside. I hauled my kayak up into the sedge grass and tied it off to a small willow twig. After a full day of paddling we were both tired. We quickly ate, set up the tent, and went to sleep almost immediately. 1. The kayaks have undoubtedly floated off. 2. I have my VHF handheld radio with me. 3. We are in a fjord, the radio is damn near useless. 4. Nobody is going to know we are in trouble for six days. 5. We are going to be cold, wet, and miserable for a long time. 6. This is not good. What I didn’t know, was that Larry had tied his kayak to mine… he had also made a deadman anchor and tied his kayak to the anchor. They were calmly floating at anchor when Larry waded out to recover them. Picture this scene. It is 3:00 am, a full moon, blood red in the sky, burning through the clouds. Dark rock walls on either side, a glacier snout on another. It’s still raining. Two grown men, wearing nothing but polypropylene underwear, franticly wading around in waist-deep glacier water, towing kayaks behind them, bobbing for cookstove, pots, pans, bags of food, soggy sleeping bags, and wet clothes and tossing them into the kayaks. This was day two of a six day trip. The camp stove never did fully recover. You’re a good man, wilco278! What a wonderful memory. Thank you for sharing it. And thank you for your good work on this blog. Feel free to show http://www.arcticgaspipeline.com as a resource link if you wish.